The Egyptian Princess is out now – both as a very cheap e-book on Amazon or a real book price £6.99 with 4 colour illustrations by Mike Spark. Peter Phillips, the time-traveller from ‘Saving the Dinosaurs’, now thirteen, is sent back 5,000 years to Ancient Egypt at the time of the Fourth Dynasty. There he finds a world where the wheel has not yet been invented, where the prayers of the Pharaoh alone guarantee that the Nile will provide sufficient water for the crops, and where Ra-Atum, the Sun God, has to travel by boat through the underworld each night in order to rise in the morning. Shortly after his arrival he is befriended by the Pharaoh’s daughter, Princess Mer-tio-tess, who believes he is a Spirit sent to help her. While increasingly attracted towards the Princess he finds himself drawn into a web of power struggles and rivalry. And things get worse when Peter, by accident, brings her back to present-day London, a cold place filled with sad looking people which, she believes, must be the Underworld. 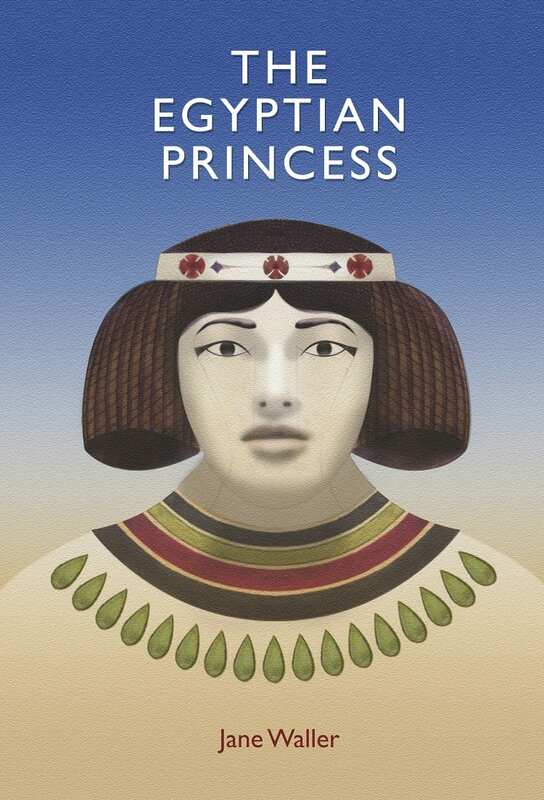 The Egyptian Princess and other novels by Jane Waller can be ordered through Waterstones – but they don’t stock them! A few signed copies are available from Aylesbury Museum. The perfect Christmas present for anyone aged 10 to 100. You’ve all probably seen a rat in your garden or in the streets of London looking for food around bins and rubbish. They say you are never six feet from a rat in London which is a very scary thought. But you have most definitely never met any rat quite a huge as Igor. 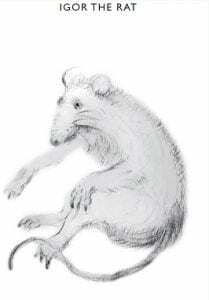 A rat of enormous size – bigger than a cat – sat contentedly at Griselda’s feet, his ropey tail knotted firmly round one of her legs. White whiskers twitched on his face. Occasionally he bared some yellowing teeth. If you live in London and have ever wondered what goes on under your feet in the smelly sewers, Under Buckingham Palace is a must read exciting page turner. It follows the adventures of Susie, who one day finds herself down in the sewers when the lifts in her flat go wrong. She is stuck in a terrifying and dangerous world where she must fight to save the life of the Queen of England against hideous sludge gulpers and grotesque slimy creatures. Can she stop them? you’ll have to buy the book to find out. If you would like to buy a copy you can buy it direct from Jane or as a Kindle book on Amazon. Meet Princess Griselda – absolutely uglificent! Have you ever seen anything quite so ugly as Princess Griselda? Well you haven’t met her mother Queen Greemould yet. To read about Suzie’s incredible adventure in the sewers of London you’ll have to contact author Jane Waller to buy your copy of Under Buckingham Palace. You’ll never see London streets, manhole covers or drains in quite the same way ever again. Does your sewer have a family of sludge gulpers, a rat army and slime grubbers? Princess Griselda was ghastly – the ugliest thing Suzie had ever set eyes on. Splodges of a vivid sulphur yellow tumbled over one another in rich profusion, snugly settling in a series of spare tyres which spanned her lower circumference. 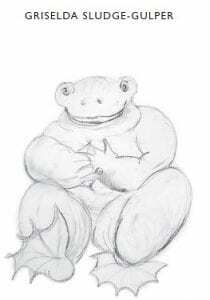 Her dark spotted eyes bulged like her arms and legs. ‘She’s… absolutely uglificent… I mean magnificent.’ said Suzie. You’ll have to buy your copy of Under Buckingham Palace by Jane Waller to hear more of Suzie’s ghastly adventures. Available directly from Jane at just £6.99 and shortly at Waterstones book stores. 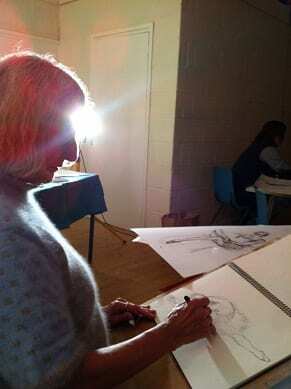 Jane took part in Bucks Open Studios again in June 2013 with her faithful group of artists at the Stuart Hall at Little Kimble. Quality, diverse works from Nile Ateem, Rosalind Castling, Leiselotte Edwards, Michael Spark, Susie Upstone, Jane Waller, James Watts. A group of established and new artists exhibiting a wide variety of exciting and well-produced artworks for all tastes and budgets. Look out for details of the 2014 Bucks Open Studios, to be held in the same venue from 7-22 June, 2014. 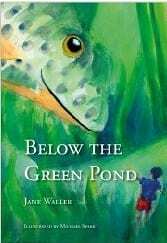 Below the Green Pond, Jane Waller’s beautiful book about a small boy who finds himself lost in the underwater world of his local pond is now available on Amazon as an ebook, a brilliant Christmas present idea for adventure, science and nature loving kids and adults. You don’t necessarily need a Kindle or ereader to enjoy this book, anyone can download some software to their PC to allow them to read this book also. All of the inhabitants of the pond live (and die) as they would in real life, and most of them are known by their scientific names: Daphnia, Dugesia Lugubris, Cristatellla, Victorella and Volvox, for example. And Owen’s first underwater friend (Sedilla, the water flea) teaches him – and the readers of the book – a lot about what goes on in the world around us, without most of us being aware of it. “Whatever does that mean?” asked Owen, feeling even smaller. It is beautifully illustrated by Michael Sparks and is a must read for all nature loving children and adults. The lights dim, darkness fills the room. like flowers reaching for the skies. Fluid traces fill the space. The dancers are as one. A spider’s web is spun. like birds in formation together. 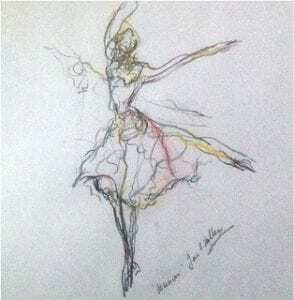 On Monday 1st October Jane Waller was invited to speak about how she draws ballet dancers in movement at Stewart Clough’s Life Drawing class in Longwick. In a packed hall a beatifully elegant ballet dancer Aisling Longshaw performed various different pieces, first at normal speed, then slower, and then holding poses so we could all have a go at capturing both the movement, symmetry and lines of the body. Drawing anything or anyone when they are moving is no mean feat. Jane had tips and suggestions for the group of how to stand back and free up your arm and hands to move with the movement of the dancer. When you’re used to drawing things that aren’t moving this is an art in itself. Jane is used to drawing dancers in motion. Add the movement to the fact that when Jane draws her dancer drawings she is in almost total darkness at a live ballet performance. It was quite amazing to walk around afterwards and admire the varied work produced by everyone in the group. Noone had drawn exactly the same thing, everyone had their own version, style and depiction of the movements. A real challenge for the whole group. Stewart is hoping to run another session in the near future with a ballet dancer because this one was so popular, fun and successful. Details to follow as soon as we know a date. 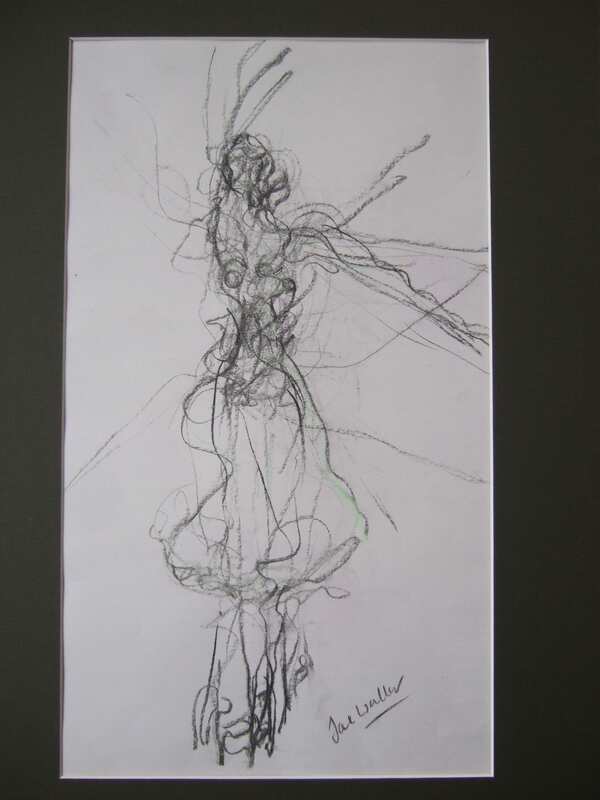 To read comments from some of the artists who attended this evening read Stewart’s blog ‘Life Drawing with ballerina Aisling Longshaw’. 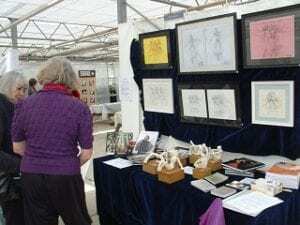 Jane took part in a recent artists and makers event at The Waddesdon Plant centre earlier this year in November 2013 and loved it so much she’ll be going back on 10-11 May 2014. This event is jam packed full of artists from painters, ceramacists, jewellery makers, printers, sculptors etc. It takes place in one of Waddesdon’s huge greenhouses, which just fills the space with an amazing light. There is plenty of parking and absolutely loads to see. It opens at 10.30am and closes at 4.30pm each day. Why not visit the majestic Waddesdon Manor at the same time? Come and visit Jane and all the other artists and stock up on presents for family and friends. What better gift than a unique, bespoke piece of art created by someone you’ve met. 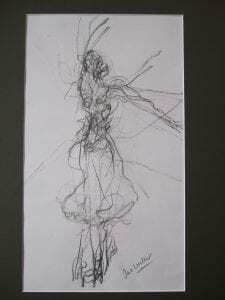 So if you know anyone who loves ballet or dancing, snap up one of her special ‘dancer in movement’ drawings.